< I buy pears all winter, a few at a time. Lately there have been many different kinds at the market and they are all so beautiful. The curve of their side, the color of their delicate flesh, the expected and yet surprisingly lyrical asymmetry of their form, make them pleasing to look at, to draw or to study. Pears are such a lovely photogenic fruit, inside and out. After choosing several different varieties from the market I bring them home and arrange them on my countertop and wait. In time they will begin to soften and grow perfectly ripe and juicy. The anticipation itself makes my tastebuds dance. While I wait I try to capture their beauty. I want to learn from their simplicity. 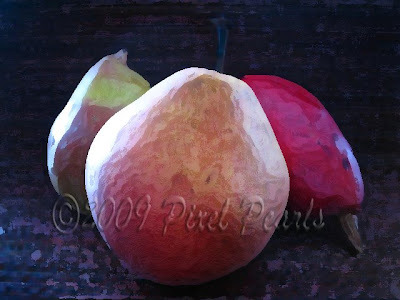 Three pears, slightly blemished and irregular in form, lie in such an interesting and natural way against each other. The interaction of curve and color, light and shadow, line and angle merge into a single relaxed image. Flattened and contoured, the contrast of these three luscious pieces of colorful fruit becomes restful, almost peaceful, as they repose on a textured mat. 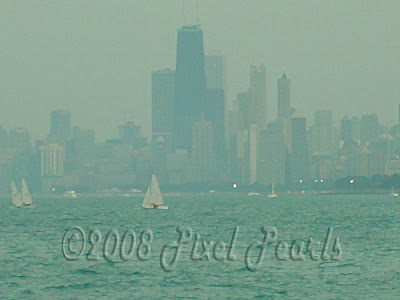 A friend shared a photo with me, of sailboats against the Chicago skyline. Eager to work with it I made some adjustments that I hoped would highlight the light on the water and the singular beauty of the featured sailboat. I adjusted the brightness and decreased the bit depth to enhance the sparkle of the waves. This softened the buildings in the skyline, leaving a whisper of their outlines. Infused with the same shades as the water, their hazy form receded as the backdrop to this sailboat riding on the brilliant sea. I like a lot of things about this image. I like the way the sailboats in the foreground are dwarfed by the towers in the background. Still, they appear indifferent, shining white against the blue-green water, occupied by riding the ripples and waves that rise and fall beneath their hull. I admire the form and function of the sailboat blending into the wind as it elegantly steers at a slight angle. I like the sense that it is at one with its direction, at peace with the tension between wind and water and that it seems focused on the angle of the wind and the gentle path its hull cuts through the rippling tide. Often I feel my sails are set against the wind and I ride the ripples and waves of my life at the edge of capsizing. Still this image and its whisper of the hectic hazy construction of a modern city contrasting the peaceful blue-green of the larger sea, is an image of serenity. It highlights the precarious balance between the elements of life and the beauty of finding that balance point to steady your course. I found this little four-leaf clover in a cache of costume jewelry at my aunt's house. It is broken, no longer bearing the pin part that once let it be worn. The decorative cloisonné of it's leaves is also chipped. It shows its age and has lost some if it's utility but it is still a handsome and significant piece, a small and interesting ornamental fragment, especially at this time of year. As I couldn't think of how to wear it I used it as a model this St. Patrick's Day. 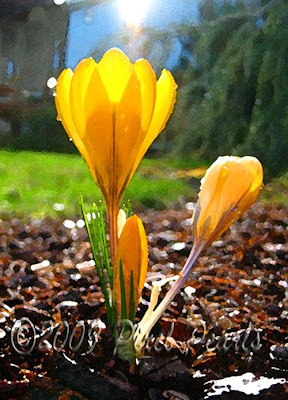 I captured this image as the sun broke from the sheltering clouds and shone across a gold colored table drape. I liked the substance it gave to the little clover pin, the depth of its shadows, the way the sunshine highlighted the superficial nicks and imperfections. I brightened the original image a little. Then I filtered it and posterized the clover for definition, engaging the way the light brought shades from the color of the leaves and the way the chipped flecks gave a charming sort of sage patina to the piece. In fact, in this case I think it is the way the light enhances the flaws and inevitable consequences of age that adds interest and texture to the finished image. I've read that each leaflet of a clover symbolizes something: the first faith, the second hope, the third love and the fourth luck. Perhaps finding this small curio will bring me a measure of good luck. 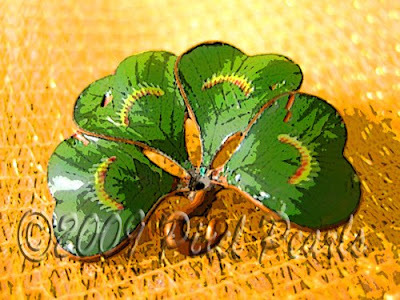 Luck has certainly been with this old pin, at least in its ongoing ability to charm and endure. Though it is old, and in some ways broken, it wears its age nobly and is still treasured. May we all be so lucky! 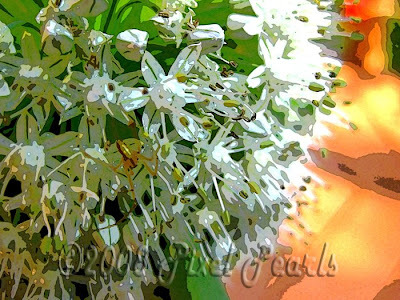 Late last summer the onions in my garden flowered. First spears formed at the end of their stalks and then the spears burst into orbs covered in small white blossoms with a pungent fragrance. In the warmth of August I found these orbs enchanting. Like a larger, prettier dandelion head the unusual blossoms had a sturdy character I admired. Finally I cut one to bring into the house and study. On my way inside a small inhabitant emerged. A delicate little garden spider climbed from the shadows beneath the flowers and gingerly walked around the outer petals. What a wonderful house the little spider had found! Imagining how amazing this geodesic blossom must be to such a tiny creature I had to smile. I felt a twinge of sadness as I carefully set him down in the bark dust before bringing the flower inside. I created this image of the tiny spider traversing the perimeter of the blossom with the hope of reflecting these simple thoughts. I focused on the spider in his world and softened the background into a bright suggestion. The colors are simple, the details basic and still the delicate form of the spider remains, defined yet almost at one with his surroundings. I love to stop and take a break from the day over a cup of good coffee. One of my favorite places to do that is Caffé Piccolo Paradiso in downtown Camas. The café is filled with interesting bits and pieces to spark a memory or a dream. Light from the large front windows glows on the warmly textured patina of the sunshine colored walls. Italian dice are laid on the table with a backgammon game underneath a map of Italy. Used books line shelves on one wall and bottles of wine adorn another. There are tables at different heights and a variety of chairs to settle into from austere to upholstered. Conversation gently lingers in the air as the tables fill and empty with friends and customers coming and going. I visit Caffé Piccolo Paradiso with my camera and a notepad. I never know for sure which will be the medium of choice until I am there. Today I ordered a Shot in the Dark with some tiny Italian cookies. 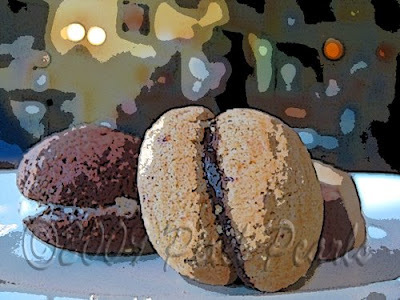 The cookies made great subjects for my camera with the warm décor of the café for a backdrop. The three of them on a small plate made an interesting study in composition. I nudged their arrangement as I soaked in the atmosphere. After a while I sampled the cookies and enjoyed their crisp texture and soft filling. They offered just a note of sweetness to the dark roasted flavor of my drink. 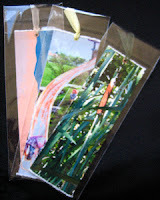 The images I took away with me are a reminder of what feeds my creative spirit.